Messaging all backers who chose a certain reward. Posting an update to all your backers. Posting an update to backers that’s also visible to anyone who visits your campaign page. Message an individual backer: To the right of each backer’s name, you see a mail icon called Send Message. This allows you to send individual notes to backers on a one-on-one basis. Message backers in a reward tier: At the top of the report for a reward level is a Message All link. Click this link to message all backers who share a particular reward tier. While your campaign is active, this tool can be especially helpful if you want to offer perks to backers in a certain tier if they pledge a little more to your campaign. 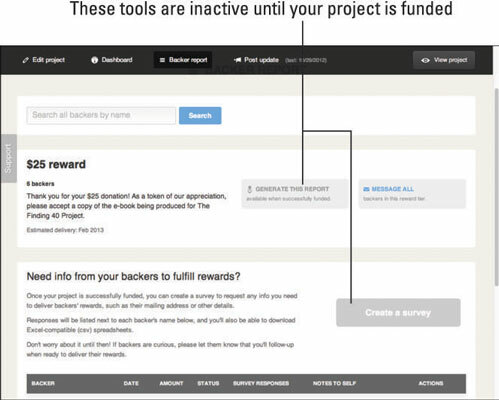 In addition to messages, the Backer Report page gives you a few other tools to communicate with backers, but those aren’t available when you’re still raising funds. While your campaign is active, you see grayed-out buttons for things like Generate Your Report or Create a Survey. Don’t worry about those items now. These are tools Kickstarter has embedded into the website to allow you to communicate with backers to gather e-mail and mailing addresses for delivery of finished products once your project is complete. Kickstarter has an excellent built-in function that allows you to communicate in bulk to everyone who has already backed your project. You can even use this tool to post generic updates to your project, viewable to everyone, not just to backers. When you post an update, your message and any media that you add appears at the top of your campaign’s main page, just above where your video appears. There, people can click Updates and see every public update you’ve posted to date. Count down the number of days left. Update backers on milestones reached. Share photos, videos, or audio relating to your project in action. On the top of your project page, click the Post Update tab. In the Title area, add a title for your update. The title should be short and action-driven, leading with terms that highlight something new or different is happening — such as “Only 3 days left to back the project,” or “We’ve just completed the proofing on our book.” These titles should show action, just like a newspaper heading. In the Body area, enter the text you’d like to appear in your update; use the formatting tools to add bold, italics, links, lists, and so on. The text should also be fairly concise and get quickly to the point about what the update is for. People can read your campaign page for an overview of your project. The update should tell them something that’s not already on your page. At the bottom of your Project Update screen, click any of the three Media Upload icons to upload video, audio, or photo files from your computer. 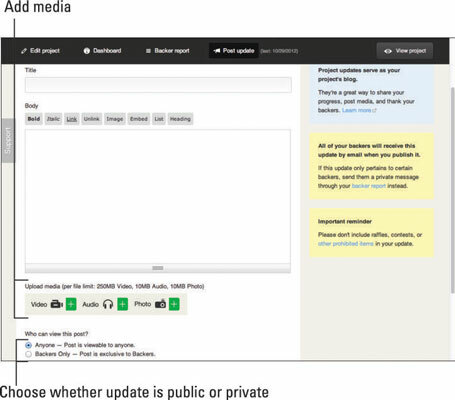 At the bottom of the Project Update screen, below the Media Upload icons, select who can see your update: Backers Only or Anyone. Make your update public for all to see or just for your backers. If your update has sensitive or financial information you only want your committed backers to see, select Backers Only. If you’re publishing a more general update and want it viewable by anyone who comes to your Kickstarter page, select Anyone. Proofread the text of your message to make sure the information is accurate and that you haven’t made any spelling or grammar mistakes. You can’t go back and change an update after you post it, so take your time beforehand, making sure the content of your update is correct. Click the blue Preview Update button at the bottom of the page to see what your post will look like; check it once again for errors. When you’ve reviewed the Preview, click either Publish or Edit from the two buttons at the top of the screen on the right. If you need to make changes, click Edit and repeat the editing process. If you’re happy with the update, click Publish to make the update go live on your page. The Kickstarter iPhone app enables you to post updates from the field. It’s a great way to post a picture from a video shoot and have it appear in real time, for example.